FOREST, Va., Dec. 19, 2018 /PRNewswire/ -- With a flurry of news reports about germs in airports and hotels, travelers have never been more concerned with cleanliness, and businesses have never been more concerned with traveler experience. NanoTouch Materials' new self-cleaning surfaces address these traveler concerns. In just the first few months after moving to their new headquarters, The Center for Innovation in Smart Materials, NanoTouch has released a self-cleaning film for touch screens that can turn any airport check-in kiosk or in-flight screen into a continuously self-cleaning surface. They have also released self-cleaning elevator button covers. These innovations add to their current lineup of travel products which include portable self-cleaning mats that the individual traveler can use on the airplane tray table or hotel bathroom vanity, and super durable self-cleaning mats for TSA security bins. This was the same product line that won the Innovation Award at last year's ISSA Conference in Las Vegas. "I think we can now say for sure that travelers are paranoid about dirty public surfaces when traveling," says NanoSeptic co-founder Dennis Hackemeyer. "Whether it's the airplane tray table, hotel bathroom vanity, or TSA security bin, travelers just don't trust the cleanliness of these surfaces." The portable self-cleaning travel mat is one product that both vacation and business travelers seem to be clamoring for since it provides a cleaner place to rest a toothbrush, eyeglasses, medications or other personal items on a hotel bathroom vanity. And it provides a much cleaner place to rest your peanuts or pretzels on the airplane tray table. "Our travel mat not only makes travelers feel safer and more secure, it's also a great in-room or in-plane amenity that can generate new revenue," says Mark Sisson, co-founder. "And because we can add the hotel, airline or cruise line logo to the mat, it's another way these travel companies can extend their brand wherever the traveler goes and however they get there." But the product that generates the most excitement from the travel industry is the NanoSeptic self-cleaning mat for TSA security bins in airports. "Over and over again, we would tell the story of how travelers walk around the airport, including on bathroom floors, then take off their shoes and put them in the bin going through TSA security," says Hackemeyer. "Then the next traveler puts their phone, glasses, keys and other personal items where those shoes were. Before we could even finish telling the story, the reaction was always the same....please stop, I think I'm going to be sick." After 6 months of testing by a regional TSA team, the NanoSeptic mats were sent to TSA's national testing facility for verification. After TSA approval, the mats made their debut at the Akron-Canton airport, providing a cleaner surface for more than 1.4 million travelers per year. 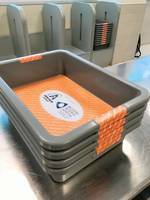 "One thing that really surprised our team was when we started getting calls about using the TSA security bin mat in other facilities," says Hackemeyer. "We designed the mat specifically for airports, but soon after the launch we were contacted by nuclear power plants and government facilities since they have similar security screening processes." NanoSeptic products are positively disrupting the travel and hospitality industry by getting businesses to look at cleanliness differently. Historically, hotels and other travel-related businesses took the approach of hiding their cleaning efforts. The old line of thought was that if people saw a facility taking steps to improve cleanliness, they might think the facility was dirty. But research has shown the opposite to be true. Travelers already assume the airplane, hotel or cruise ship is dirty. Furthermore, their purchase decisions can be directly affected by addressing hygiene issues and making clean visible. A NanoSeptic self-cleaning mat placed on the bathroom vanity of each room in a hotel has been shown to cause a "halo" effect, positively affecting a guest's perception of the cleanliness of the room and the facility in general. NanoSeptic self-cleaning products could also be a valuable part of a hotel, airline, cruise line, or credit card reward program. More than 150 travelers volunteered to be part of experiential market research that was conducted at the Akron airport on the day the TSA bin mats were launched. To download the research report on traveler perception just visit www.nanoseptic.com/traveler.